I would recommend this trip to anyone who wants the food experience of a lifetime. 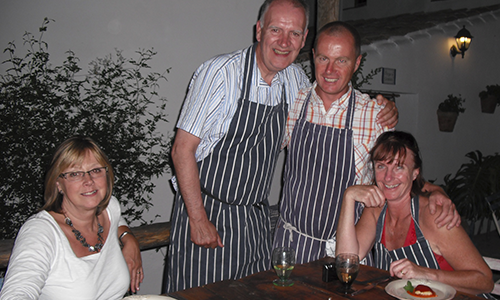 You don’t have to be an experienced cook to enjoy all that Finca Las Encinas has to offer. Even if all you’re looking for is a place to find beauty and peace, I would book a trip here and enjoy all that Clive, Maki, and Cei have to offer. It was an absolutely fantastic experience. The food was the best we have ever ever tasted. Combined with the glorious setting, the charm of your finca, the pleasure of the cooking lessons, the superb organisation of our sightseeing and your thoughtful care of us made for an unforgettable, magical experience that we will treasure for the rest of our lives. Thank you from the bottom of our hearts for giving us the chance to be part of the Andalusian way of life and taste the delights of Andalusian cuisine. Very rural Spanish which was lovely insight into the true Spanish way of life. We could not have hoped for more. It was like staying with friends who knew a lot about cooking, and who were willing to share their knowledge with you. Thanks for the holiday, it has given me more confidence in my cooking, and inspired me to try new things. We felt at home very quickly because of your hospitality, even when we had some rainy days. The floor heating was superb. The fish was so fresh, it was prepared to its best. Very interesting wine list, it is brilliant. Lovely antiques pieces and love the fluffy bathrobes! We had such a memorable stay. Our stay really recharged our batteries making us able to cope with the bad weather in Denmark. During stressful days with rain or snow we look out the window thinking of the tranquility of Finca Las Encinas. You made our weekend perfect. It was an absolutely brilliant stay, and all of you made it enjoyable and fun. I learned so much just watching and talking to you all. I know it is very hard work, and felt immensely privileged as a result. We never ate as well again. The best thing of all was the after-dinner chats. Thank you for everything! Thank you so much for creating such a wonderful space for us. I needed a holiday badly when I arrived – and I returned back home feeling refreshed and happy… not least because of the deeply welcoming and relaxing atmosphere at your finca. 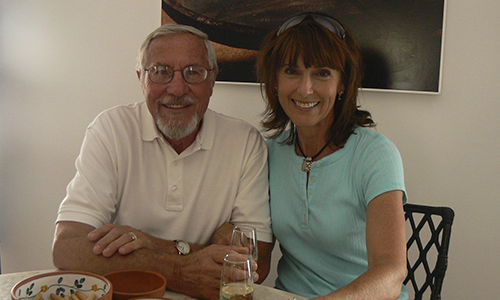 Doug and I arrived home safely on 3 May after 3 weeks in Spain. Staying at Finca Las Encinas was definitely one of the highlights of our trip. 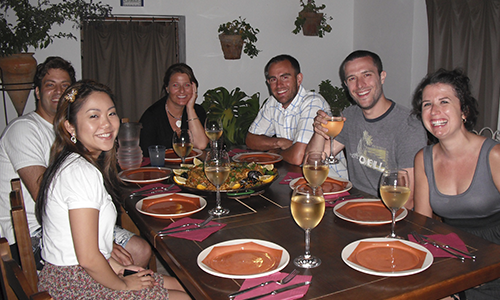 Thank you for the wonderful meals, cooking classes and hospitality during our stay with you. I wanted to say a huge ‘Thank you’ again for the lovely time I had whilst with you. It was so very special. Mike and I had with all of you. 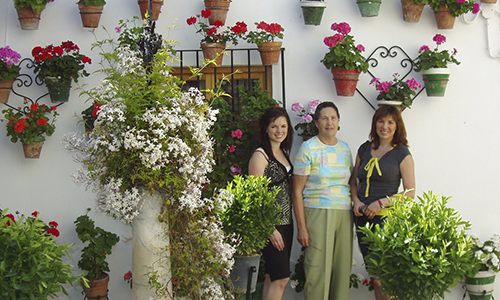 We haven’t eaten so well or been made to feel so welcome and relaxed at anywhere we’ve stayed before and really look forward to staying with you again on our next trip to Andalusia. Clive and Maki are good people and made my stay a pleasure throughout. Both are delightful and educated conversationalists. Good family atmosphere is enhanced by their friendly and lively son.